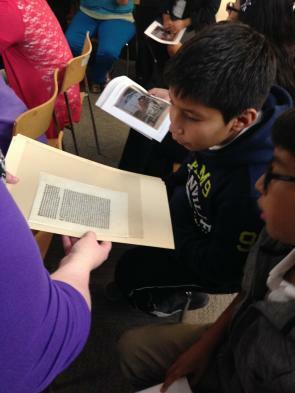 A field trip to the Gilder Lehrman Institute of American History gives students the unique opportunity to learn history from real documents, up close with no display cases. This exciting experience creates tangible links to the past as students connect with original materials. To start the the reservation process, please visit the Book Your Field Trip page. We will be in touch to discuss your program and confirm the details. You can find more specific information regarding the logisitcs of your visit on our Preparing for Your Field Trip page. For more information, email Sandra Trenholm, trenholm@gilderlehrman.org. Examine original documents from American history up close—with no exhibit cases. Discover amazing background stories that humanize historical figures. Engage in hands-on, inquiry-based learning. Learn about primary sources from people who work with them every day. Enhance critical thinking, reading, and writing skills. Create a tangible link to the past through artifacts. Explore the actual documents students are learning about in their textbooks. Experience a unique way to supplement work in the classroom. Make learning American history fun! Students will interact with materials that include both iconic treasures of American history as well as high-impact, lesser-known materials that demonstrate individual contributions to history. They will view the original documents up close and receive their own printed copy to read and analyze while our history educators help them uncover “secret” background stories and provide historical context. What kind of primary source is this? The Gilder Lehrman Institute of American History believes in empowering students to form their own opinions about the texts they read. Students will be encouraged to formulate and express their own opinions of history. As they experience the work of historians, participants create personal connections to the past that bring history to life. Students do not have to have extensive US history content knowledge or even be familiar with primary sources. Our staff can adjust the workshop to meet the needs of a particular class—from primary source beginners to experts. Our primary goal is to excite and motivate students to want to learn more. Students will gather evidence, make logical inferences, and support conclusions using multiple sources of information as recommended by the Common Core State Standards for Language Arts and Literacy. There are eight standard sessions that can be customized for grades 4–12. Themed sessions, such as women’s history or African American history, are also available upon request. Each session runs 90 minutes. We can accommodate 30 students per session. Sessions must be booked at least three weeks in advance. * Search our list of Affiliate Schools to see if your school participates in our Affiliate School Program. Learn more about the many beneftis of joining the Gilder Lehrman Affilate School Program here.